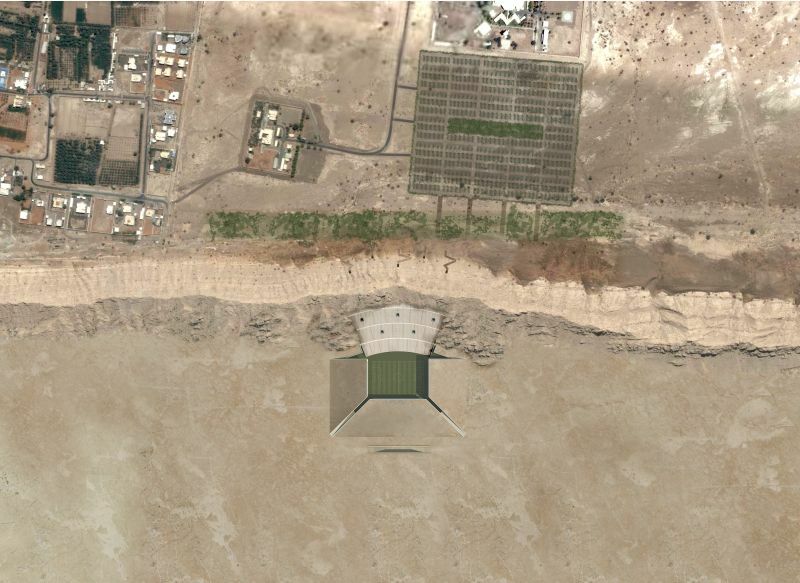 Sunken into the cooler depth of the desert sand, the stadium, like a hidden treasure, presents itself to the visitor as a series of sharply inclined planes emerging from the ground. These planes, in addition to the volcanic mountain backdrop in front of which they lay, define the space of the stadium and its related activities and create a magnificent place that allows for the conglomeration of a large number of visitors in the heart of the vast landscape. Issues of scale, timing and activity were highly investigated by the architects and by forcing the stadium into the ground, the designers were strategically able to deal with the challenging issue of massiveness of scale and of the often voided space. The project not only gracefully blends itself into its surrounding but plays on the notion of distance to alternate between a strong camouflage at distance and a forceful presence at close range. 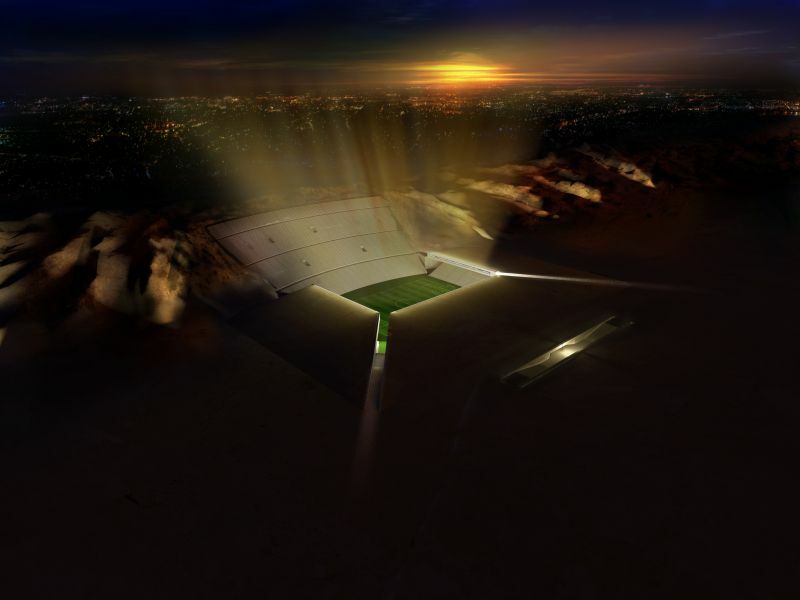 A sculpted landscape or a defined void, the project becomes a jewel in the desert which lights up at night allowing the active evenings to turn the stadium into a massive light beam that emerges from the ground straight to the higher sky and creates a symbol, a sign, a guiding agent to the national event and place of activity in an otherwise sign-less desert environment. Inspired by ancient examples of stadia and temples, the project refers to the first greek stadium that worked with the topographic landscape of its site, taking it a step further and challenging the site to new measures by sculpting it, refining its elements and playing with the mass and void relationship. The project also borrows from the Temple of Anahita and the idea of grand entrance into the underground world and creates a monumental approach to the space of events. Whether it is the long and narrow corridors connecting the parking space to the stadium by scattered openings and perforations into the main rock façade, or the breaking planes emerging from the ground and creating at their fractured intersections carved out passageways that lead the visitor into its underground heart, the entrance to the stadium is a magnificent one. Working with the existing site and using the local materials, the architects find themselves playing with a carefully studied palette of rock and sand that not only lead to the main façade/visual panels system adhering to the site but also create a more sustainable approach to construction and design where no material is forgotten or displaced and where all is reused. Carful patterns are created with the recuperated stone, creating interestingly designed man-made strata patterns that emphasize the natural characteristic of the site. This simple yet majestic design hides great achievements and brilliant experimentations with issues of scale, monumentality and locality. 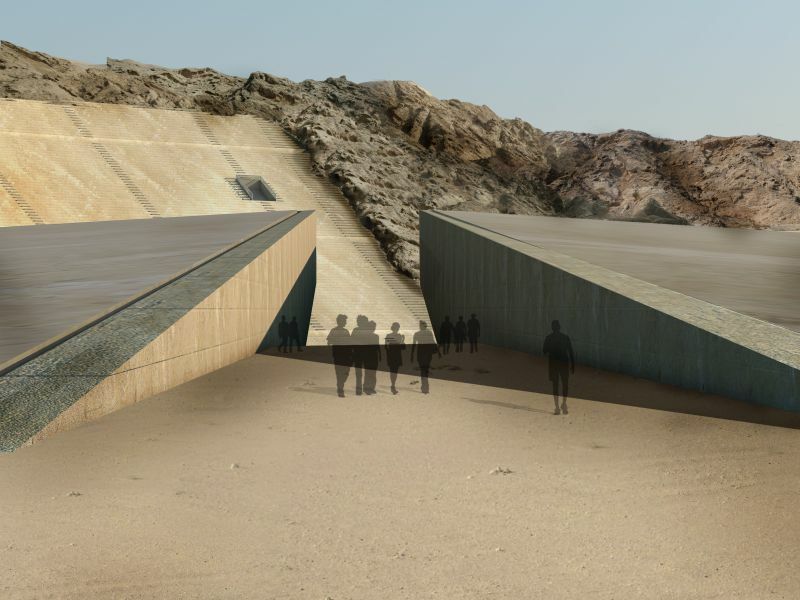 It allows the project to create a strong sense of place in an otherwise homogenous area of the vast expanding desert. MZ Architects has received the Retail and Leisure Award for the design of “Al Ain stadium” at this year’s prestigious MIPIM Architectural Review Future Project Awards ceremony held in Cannes, France, on March 7th 2012. The project by MZ Architects, a Lebanese design and consultancy firm, was one of 143 entries to the awards that uniquely focus on building designs for projects awaiting construction or still on the drawing board, spanning over ten categories – Big Urban Projects, Mixed Use, Offices, Regeneration and Masterplanning, Retail and Leisure, Retrofit, Tall Buildings, Sustainability and Residential. With a strong focus on creativity, the MIPIM Architectural Review Future Project Awards showcase schemes that are not only examples of excellent architecture, but have also responded to clients’ development briefs and considered their impact and contribution to the community with effective environmental and social responsibility. The awards, marking their 10th anniversary this year, form the centerpiece architecture event at the annual MIPIM Real Estate Conference and Exhibition, The International Property Market which is the world’s most influential event in the real estate sector and attracts over 20,000 delegates every year from around the world. Marwan Zgheib – founder of MZ Architects – and Jad Zgheib – Assistant General Manager – received the award at a formal ceremony held at the JW Marriott Hotel on March 7th 2012 in Cannes, France. Some of the world’s most influential design and real estate professionals were present to honor the elite MIPIM Architectural Review Award recipients for 2012, with projects hailing from China, Turkey, Abu Dhabi, Brazil, Czech Republic, Poland and Denmark. The panel of professional judges chaired by Paul Finch, Editorial Director of The Architectural Review included Roger Zogolovitch, Director AZ Urban Studios; Peter Stewart, Peter Stewart Consultancy; and Sutherland Lyall, author and critic. The judges described MZ Architects’ design of Al Ain stadium as “an extraordinary project”, and applauded the brilliant way in which the design works “with the existing, absolutely exploiting it and creating what we call a very sustainable approach in construction”. Set into the desert landscape, the Al Ain stadium sinks its 200,000 m² structure into the ground and turns the rocky mountain into one of its main features. It creatively works with the topography and relies on a series of emerging planes to mold the space and help cater for the 40,000 seats which it provides. 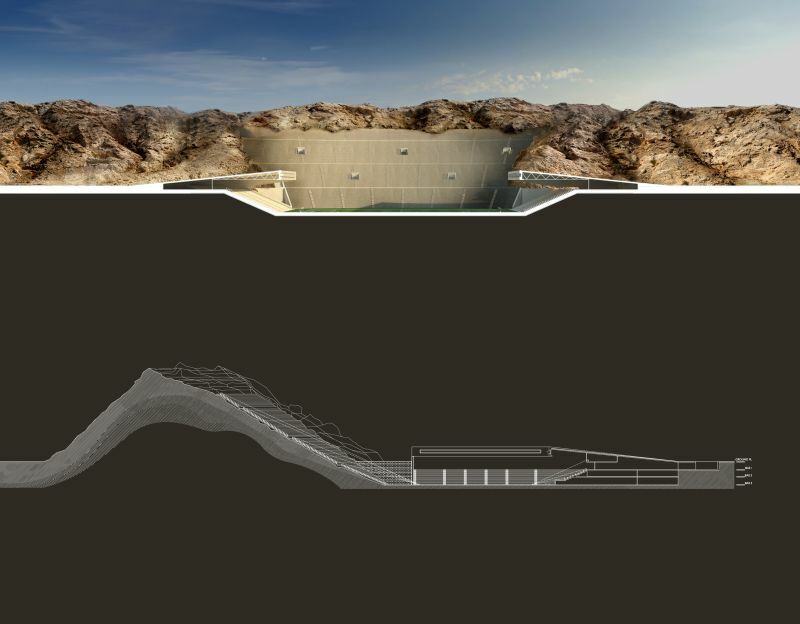 “Our main challenge was to integrate a massive modern stadium adjacent to a strong natural site such as Jebel Hafeet while preserving its authenticity. The solution was not to be next to the site, but rather to be within it. This is how we came up with this unique stadium concept which reminds us of the Greek theatre that worked with the topographic landscape of its site”, explained Marwan Zgheib. The stadium maximizes the use of on-site material and its visionary design merges landscape and architecture, thus blurring the boundaries between the built and the natural and creating a space that allows the visitor to interact with the stadium activities as much as with the desert landscape itself.